Do Fenway Fans Scare Umpires? As of this moment — and we can only be certain of the statistic because the Yankees will be on a plane to Seattle in five hours and therefore don't have time to add to their total — the Yankees have notched fourteen walk-off wins this season, after Francisco Cervelli's ninth-inning single to win last night. According to special scientific mathematical Sports Section calculations, that's ten A.J. Burnett pie attacks. Hey, at least something he's throwing these days is hitting its target! Ho ho! The fourteen walk-offs are actually three short of the all-time Yankee record, seventeen, back in 1943. (It seems unlikely they'll break that record, barring a ridiculous final two weeks.) But they didn't have tattooed right-handers tossing sweet pastries back then. We'll filter the Yankees' walk-offs through the prism of Burnett's pies; we like to imagine him sitting in the back of the dugout during a Yankees rally, slowly, stealthily turning on the oven and kneading the dough, slightly demented but still good-hearted, Lyle Lovett in Short Cuts, in pinstripes. Have the Yankees tied the game up in the eighth? Time to pre-heat, A.J. 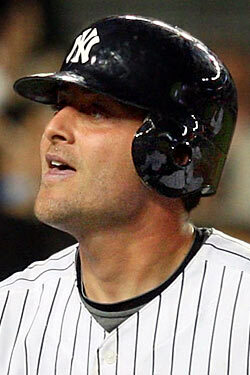 Cervelli almost seemed happier last night to be hit with the pie than he was to notch the winning hit. "I was excited," he said. "I was looking forward to that part." The tradition started back in May, during the weekend of walk-offs against the Twins. Burnett struck Alex Rodriguez first after his Game 2 home run, probably because A-Rod is famous for getting ravenously hungry after games. (Note: This is not true.) Johnny Damon came next, and the game was on. The pie victims since then: Melky Cabrera, Jorge Posada, Hideki Matsui, Nick Swisher, Robinson Cano (twice), and Cervelli. Since the tradition started, the Yankees have had only one walk-off win in which Burnett didn't do the pie: After the Mets' Luis Castillo dropped that pop-up to give the Yankees a win back in June. That would have just been rubbing it in. Figuratively, that is. The Yankees should make a funny scoreboard video that comes up in the eighth inning, right after the Rocky Balboa That's how winning is done! clip, of A.J. Burnett in a big chef's hat, putting a finger to his lips while checking on his stove. That would be awesome.